None of this matters...it was still supposedly written 700 years after the fictional Jesus supposedly lived...it all means nothing. Only the Vatican has the 'real' story of Jesus in their vast collection of archives. And the Vatican does NOT reveal all of its writings. In particular, no pictures exist of Pope Urban II handwritten statements. That is a NO given the immense influence he has had on Catholicism's outreach. The Vatican has nothing....except the records of suppression they've engaged in for the last 1900 years. In other news, I have just buried a data cd in an undisclosed location with the story of how I am the Son of God. Should be interesting what is made of it in the year 4114. Jesus Christ was/is not fake. Of course I didn't read it....but I am curious....were the Crusades covered in there? How about slavery and how the bible affected the beliefs of slave traders and owners up to thousands of years later.....was that covered on your link? Kermit...well I should hope so! Seems some Christians deciphered parts of the bible differently than the ones using the bible in order to keep slaves. How could that be....I thought the bible was in-ambiguous. But Kermit.....who gets to decide what the authors really meant, and what is the basis for their decision? Kermit....context makes it open for interpretation. Either you take the book literally as it stands, or you read into what you think the authors meant and rationalize it however you want. Sorry, but I don't work that way....when Jesus said that you had to hate your mother and father to be his disciple, then that is what you have to do. No translation necessary. Kermit....you don't KNOW anything of the sort. You are only supposing. You were not there and there is no way to KNOW exactly what was meant. That means, the entire book is open for interpretation. That is why so many different sects exist all using the same manuscript. Kermit...I'll thank you to stop making inferences about me. You don't know me at all! Just because I don't agree with your version of this fairy tale doesn't mean I'm a pessimist. That would be like me saying that you are an idiot because you believe a Bronze Age Jewish carpenter was the son of god. I can certainly think that, but it would be rude to actually say it. And no, I still contend that you can only suspect what the writer meant, not know for certainty. You may even have a 99% idea, but you don't know. Discussing this is like debating whether Santa Claus really had a wife and lived at the north pole.....fantasies can go anyway you want to argue them.....and this is a form of insanity. I'm not convinced one way or the other, but does anyone else find it funny that some people with use science to prove findings like this that challenge their religion are fake, but reject science when it proves them wrong? The Bible offered ZERO new science and claimed that all the laws of science apparently are optional. Not good to try to use science to support nonsense in the Bible. Actually there are many scientific references within the Bible. Job describes the parting of light, how the sun creates winds, how the pressures of the earth create gem stones. And what of God's depiction of himself as light? Why did God choose to describe himself as light? We now know that photons which possess properties of light and matter can act outside the bounds of every other scientific thought and process we understood, in fact if you'll look at a recent Time magazine article "The Infinity Machine" you might start to understand the truth; that we only know what we think we know, that we cannot know the truth in our state of being, it is simply beyond our ability to experience it or even comprehend it. I believe science is beginning to reveal this, but it will probably be another generation before humans start to recognize it simply because we are so slow in our response and collective thinking and saturated with mis-information through our various mostly corrupted media outlets. I think the science within the Bible is actually far more advanced than we humans tend to give it credit for. We prefer to deny the existence of a creator simply because most of us don't want to have to be accountable to one, all the while we fly in the face of our most basic science and the Bible while trying to "prove" that life came from non-life spontaneously, without a designer, which really makes no sense at all. Do you have an example? I honestly can't think of one. I agree. In this instance "science" is being poked at like it came up short in verifying the authenticity of the "wife" fragment. Sciences only role was to carbon date the papyrus and analyze the ink. Which were done satisfactorily or we would have read about it. The back and forth over authenticity was between biblical scholars and dead language experts. Also note that proving the John fragment false was pivotal in proving the wife fragment false. Carbon dating was key in proving the John fragment false so "science" really did help make the day. Exactly. Somebody gave the fragment to a scientist who used carbon dating, which was learned after years of research by previous scientists, to find as close to an exact measurement as possible. Too many people just ignore what they don't want to hear. No kidding...like the IPCC who rejected their own research when it failed to support their position and omitted it from their findings . I'm sure the IPCC had a group of scientists do all the research, and I'm sure they had ownership of the findings too. This is why its hard to trust corporations that conduct in-house research. If they own it, they don't have to make it public. A sad but true story. The IPCC is the the International Panel on Climate Change under the the United Nations...not a corporation. It's possible that "Evidence" for God will always be disputed, whether or not it exists. The nature of the subject arises such intense feelings in everyone of all belief systems that a vast number of people will misconstrue, dilute, and couch the facts until those facts fit the desired point of view. Evidence of god ends the discussion. And the Laws of Physics buries it. Sorry to burst your bubble but check the polls. Atheism is significantly on the rise. Truth is not dependent on polls, in either direction. Check the polls, do the research, pray on it or check your magic 8 ball. Free thinking is on the rise and faith is sliding. It's been going that way for years. "Clean-up on aisle 4! Someone attempted bulk purchase of 'truth' and the skid just fell on top of them and made a huge mess." Sorry thefinisher....you're wrong.....but I'm not really sorry....most people like you do hold on tho your fantasies so you can get to that heaven that no one knows how to locate or where it's at....where is it....? Thank it's adherents for turning it into a full-blown religion, complete with saviors, creation-theory, gospel, and self-stimulation opportunities. First, there is no thruth on your site, just smoke and mirrors...second, stealing advertisement is a sin. What did Jesus ever do to harm anyone? Yet, nobody dares attack or attempt to discredit Mahatma Ghandi or Buddha and other enlightened people or that which was written by or about them? Especially, Harvard Professors standing on their credentials to promote heresy against Jesus and his Church. Why is that? Heresy is simply the same as saying that someone disagrees. Since you do not know if ANY of the stories of jesus, or any of the words allegedly spoken by him are in fact what happened, you do not know if it is heresy, or is my questioning the validity of the stories also heresy? Heresy...a wod the christians took from the greeks and changed the meaning to mean anything ever said that opposes the bible...except that much of the bible is heresy, since it contradicts itself. The comments are non-responsive to a simple question designed to reveal the point that there is no rational purpose behind the antagonist conversation. This response is an excellent example of how people would rather attack another's position than advance the merits of their own position. It seems as if you have no qualms about attacking the "Harvard Professors", though. I did not attack anything. Simply pointed out that heresy means that someone disagrees...it is a word that the meaning was changed by the christins to mean something more than disagreeing. Since the bible itself disagrees with the bible, then some of the bible must be heresy. I think my response holds water just fine. Two word answer: "his" churches. In much sincerity, who else is there? Jesus started "his" church through Saint Peter who was the first Pope. What other "churches" were there before Jesus? There were Jewish Synagogues, but it was the Jewish people who acknowledged the monotheistic God and idea for a place to worship one God that follower's of Jesus advanced as "his" church. Christianity is polytheistic. They only worship one god, but even their god tells them there are other gods...why else would he have told them to not worship the other gods if there were no other gods to worship. He didn't allegedly say not to worship false of non-existant gods, he said not to worship the OTHER gods. There are over 40,000 "Christian" "churches", each saying that **they** have the correct interpretation of "Jesus's" (whoever he was) ideas, and that the others are preaching heresy. I get your points about Christian "churches"...which really are "denominations" of Christianity. Christianity cannot choose who decides to call themselves "Christian" no more than any other group...but, calling oneself a Christian does not make it so. This is not an advertisement for the Catholic Church...merely an explanation of the term as the original idea. The Greek meaning of Catholic is "universal." And, that was the idea Jesus had in mind...everyone belonging and coming together in a universal church...in community. After almost 1,600 years of a universal church, Martin Luther (not a debate about his reasoning, just the fact) chose a different direction for his version of Christianity leading to all other Christian denominations, some without any relation to the original Christian ideas. So, a single human being who didn't get his way, rejected Jesus' notion of a universal church in favor of separatism. please, the scope of this commentary is limited only to the many denominations and no more. Factual History – The real people who started this country left England to escape the tyranny and religious persecution of a King who imposed his state religion on his subjects to control them. The First Amendment provides that "Congress shall make no law respecting the establishment of religion..." Understanding that behind every law lies "legislative intent" it's easy to see the framer's intent behind the Establishment Clause was to keep the government out of religion...not religion out of government. What specific law are you referring to? Fundamentally, law can be traced to morality and ethical behavior. Law is the minimally acceptable conduct from the governed. It constrains what people "can get away with" but not what is right and just which is a much higher standard for societies. It may be legal to burn Bibles in this country, in this country, but is it the right thing to do? The answer to that question depends on whether you believe it is right to burn a Koran? The idea that anyone is "trying" to get Jesus into a "secular" jurisprudence system is simply not factual and without merit. Was there any lesson Jesus taught that you would disagree with, i.e., love your neighbor as yourself? How can anyone violate any law if they subscribe to that as a philosophy whether you agree or not? And, that pretty much drives the legislatures. By the way, Ghandi was all about changing the law in India and for humanity. Natural law is a body of law that precedes and lays a foundation for all other laws. God was not mentioned in the Const!tution for a reason. Look up the treaty of tripoli. America is not now, nor has it ever been a christian nation. Also, you actually quote from the Buddha with "love your neighbor as yourself", since Buddha was teaching that for over 400 years BEFORE the christian god was written. Where did you think the idea for Jesus came from? It came right down the Slik Road. Idad....there are many laws that are based on religious requirements, too many to really list, but this site has a good listing of those laws, both at the federal and state levels: http://www.religioustolerance.org/lawmenu.htm. One law currently in Oklahoma is probably going to the Supreme Court. Oklahoma has a law allowing religious statues to be erected on state property as long as it was paid for by private funds. Subsequently, a statue of the ten commandments was put on the courthouse property. Naturally, when the atheists wanted to erect their own statue, they had a fight on their hands. I'm surprised you hadn't heard about that one.....it's been in all the headline news lately. Get it right. Satanists want to erect a statue not Atheists. Regarding your religious laws I agree they exist and it is a travesty. I think you need to do some reading about those Puritan pilgrims... and what they believed, and who **they** persecuted. Many left England because the King (or others in power) would not make the Church as harsh and strict as they wanted. We should be so glad that wiser heads prevailed in establishing the laws of this country! "Their isolation in the New World, their introversion, the harshness and dangers of their new existence, their sense that they were a new Chosen People of God destined to found a New Jerusalem – a New City of God in the midst of the wilderness – insured that American Puritanism would remain more severe (and, frequently, more intellectually subtle and rigorous) than that which they had left behind. The American Puritan tended to interpret the Bible, which had supreme literary value because it was the perfect word of God, even more literally than did his British counterparts. Though many of the original American Puritans – many of whom were both preachers and authors – had attended English Universities, they tended to form religious oligarchies and sought to establish a purified church – which meant the frequently harsh imposition of religious uniformity upon an unwilling populace. Thank you to all for sharing comments that obviously matter to you and I honor all of them. Please notice that there is not a single response to my original question or even an attempt to resolve the syllogism presented. When seeking to be understood, try first to understand. What does that say about respect for others? idad....actually, I believe the answer to your question was given several times. You really asked 3 different questions in your original post. I believe that one answer that was given to you was his churches as a reason why people tend to attack jesus. Another answered that the entire belief of jesus is in question, so that was what the attack was meant for. I answered a follow up question, but would be happy to provide an answer to your original question. As an atheist, I am not attacking Jesus as a man at all. Whether he truly existed or was simply an amalgam of several gods is unimportant to me. However, the idea that he was the son of god is truly what I object to. There simply is no proof. Because of this, approx. 30% of the worlds population are believers, yet close their minds to the consistently growing revelations of science. They do this because they do not want to have their faith questioned. I see it in my own family and with politicians, and with too many other citizens of this country. Lack of scientific acceptance is a growing fear to most of the intelligent community, as it puts us farther and farther behind the progressive countries that are not adopting religion as their scientific dogma. Is this an acceptable answer to your question? What unadulterated bullsh1t. You have to be gullible enough to buy into religious dogma to buy into your garbage. What did Jesus ever do to harm anyone? According to Christian doctrine, nothing. Yet, nobody dares attack or attempt to discredit Mahatma Ghandi or Buddha and other enlightened people or that which was written by or about them?This a story primarily about Jesus. Naturally he would be the topic of comments in this comments section. There have been plenty of articles trying to discredit Ghandi. Google them. Especially, Harvard Professors standing on their credentials to promote heresy against Jesus and his Church. I don't see that here. Care to elucidate? Why is that? See previous answer. subject in the article where these comments began...also, Harvard Theological Review withdrew Ms. King's article about the subject. Which means what? You asked, I answered. Ghandi is not shoved down my throat at every turn. He don't threaten burning in hell for all eternity if I don't buy into ridiculous stories and violent and bloody scripture and perhaps most importantly I have proof that he existed. Ghandi's opponents were primarily its own Congress and the Brits who were stakeholders in defeating his ideas. Those stakeholders had everything to gain in their frontline battle. How are you a stakeholder in defeating Jesus? What do you have to gain at the expense of others? How did you get so angry as to attack the writer here? I was pretty incensed that you would try to compare a fiction such as a devine jesus to Ghandi who's life and accomplishments are a matter of record. It's like comparing spongebob to Jacques Cousteau. I am not angry, least of all at an anonymous poster There is no anger in stating the fact that you used a word incorrectly. The rest of your post is presupposition. And I regret answering you, as it appears you are not particularly interested in conversation. and...your idea of conversation is pointing out what you believe to be a mistake vs arguing the merits of your view. You want me to believe that you understand logic and argument...what is that they call a response criticizing the person instead of arguing the merits of one's position? If you know logic, why did you fall into the fallacy trap? How did you engage in the conversation? All you do is criticize the writer...that's really productive. Idadcocatus – I agree with the premise of your post. I admit I have to consciously try (and sometimes fail) to not take a cheap shot when frustrated with someone who will not reply to points or counterpoints made, but instead retreat to sweeping euphemisms, personal attacks or sometimes just plain nonsense. It's a test of character I don't always pass. I will point out that there are times on this blog when the behavior you point out is the only behavior demonstrated. Can you provide a cite for any statement Jesus made condemning anyone to "hell?" Or, was it actually someone else? It is obvious to anyone reading this blog that most don't have any idea about facts, and instead rely on their experience. How's that working out for you? Can you provide a verified cite for *any* statement that "Jesus" made... period? Or, were they *all* made by someone else, saying what they said that he said? I assume you are trying to split hairs. So let me ask, who judges those worthy of hell? God. Are God and Jesus the same person/spirit? Yes. Then closing the circle, Jesus judges all who go to hell. I feel like I am having a discussion with my kid as to why Smurfs are blue. in review, I haven't indicated that I believe in Jesus personally, and nobody is trying to convert anyone. The only thing that has emerged here is tremendous hate...the very thing you all profess to be against. My comments are merely an exercise in rhetoric where I've proven precisely what Plato wrote about in the Phaedrus..."nobody cares a rap for the truth of these matters...but only about what is plausible." And, serving self-interest. ldadvocatus..why do you feel that those that disagree with you "hate" The responses I read are quite measured.. If anything you appear to be irritated that folks can answer your questions. As an atheist I ask, we all ask, only for proof of the wondrous events you claim for the deities you tell us exist. If simply asking for proof is hate then i guess I am guilty..
What was my question...and, what were the answers you see? What "wonderous events" did I mention? What deities did I mention existing? You claim you are simply asking for proof...proof of what? You don't even know what I wrote. That's a pretty good example of hate....attacking something you made up and pinning it to someone else. Idad.....your questions were answered several times with absolutely no follow up from you. And, they were answered quite civilly, I might add. When you kept asking for an answer, even though they had already been answered, you got defensive. If you won't like the answer to a question, then don't ask it. if you removed your blinders long enough to read, I mean comprehend, the penultimate response, you would see that it spoke only to "Evolved's" post. By the way, the original question was never answered...please point to the cite (cut and paste)...make your case pal! how can you call yourself "gulliblenomore" when you apparently fell off the deep end into the gullibility of deceptive information. Do you really believe you know better than almost 6,000 years of God and 2,000 years of Jesus the Christ? How arrogant is that thinking? It doesn't matter to anyone but you what you choose to believe. I started this thread with a simple question that revealed very predictable responses. Instead of respectfully answering my question and allowing the conversation to flow from that topic, it became all about you (and others) and what mattered to them. I have studied humanity dating back to first language and migration out of Mesopotamia. I have studied every belief system man conceived of including all religions...its not rocket science...just requires an intense desire for facts whether the best evidence is inference or actual, still seek the best evidence possible to make good decisions. Why is humanity even here? So people can work to buy things they can't afford as conditioned by the social machine where corporations and government manipulate your every predictable move? Then, keep feeding the machine by passing that experience on to every other generation? Really? The great philosopher (and mathematician) Renee Decartes postulated "I think, therefore I am." And, people bought in to it because it was clever...they were "gullible." All anyone has to do to change their experience is change their view "I am, therefore I think." Idad....I'm sorry....I didn't realize I was dealing with a condescending azzhole. I thought you were genuinely interested in an adult conversation and actual answers to your questions (which were answered many times). You mentioned your study of "all religions" but you only reference a starting point of 4,000 years BCE. Since you have studied all religions, I'm surprised you aren't aware that what appear to be the first cerimonial burials which assumes some kind of religious belief date back before 200,000 BCE. The first solid evidence of organized religion dates to almost 10,000 BCE. A sphinx was discovered that dates to 9,000 BCE and the foundations of Stonehenge are about 8,500 BCE. I am curious why your intense study of all religions is focused on such an abbreviated time scale? It would appear this was some sort of game or test, where the rules were known only to the gamemaker. Some desert dweller, or a few of them, named jesus probably did exist, but there is no rational reason to believe in a divine jesus. Actually when the books of the bible were first selected at the council of Nicea in 325CE there were a lot of disagreements. The biggest one was over the divinity of Jesus. A sizable contingent of Bishops did not think Jesus was devine. It was a major schism. The pagan (newly Christian) emperor Constantine actually paid the bishops to get it done and make a decision. Not sure if it was actually voted on or just purchased, but at the end of the day is was determined by men (with a few more coins in their pockets) that Jesus was divine. Not exactly a popular mandate. "What did Jesus ever do to harm anyone?" Christ Himself did nothing to harm other (unless you count slandering/discrediting the Pharisees and Saduccees), but His followers certainly have for nearly 2,000 years. "Yet, nobody dares attack or attempt to discredit Mahatma Ghandi or Buddha"
Those folk aren't worshipped as God incarnate – but regardless, Ghandi was not without blemishes. He was an admirer of Mussolini and even presided over a Black Shirt parade. As for Buddhism, in Ja/pan, there is a branch called "Critical Buddhism" that calls out many of the traditional Zen Buddhist tenets. Finally....someone who answered the question....thank you to "idiotusmaximus", "hotairace" and "doc vestibule." You actually stepped up and boldly articulated your point of view. There is probably one fact we can all agree on without any proof...NOBODY KNOWS if GOD exists! I'm not aware of anyone reporting from the front lines of death. Otherwise, FAITH would be unnecessary. And, this game would be over. If anyone knows otherwise, please share. The question was "What did Jesus ever do to harm anyone?" and the answer is "Nobody knows if God exists? How can you not be embarrassed when you post a response that has nothing to do with the conversation in the thread? Do you really want the readers to know you are so eager to find a flaw in what I write, that you ignore that which is said? Try again....step up like the 3 I thanked and risk an actual point of view on the subject at hand vs chasing me around and nipping at my feet like a little chihuahua. I responded to your question a day or so ago. I also responded to your post where you said you studied "all" religions intensely and I posed a question to you. I also responded to your post were you asked for a cite where Jesus condemned someone to hell. You did not reply to any of the above, which is OK because watching your posts it appears you are condescending. You praise the three that answered your first question like you are passing out gold stars. You are not someone I want to have a discussion with so let's just leave it there. I should not have made that last post as it served no purpose. No excuse. I don't know how airplanes get from point a to b (even though the science can be proven, I don't have the time to invest in the effort) and so I have faith in the people who do know that all will be ok. For example, atheists have faith that there is no God, because they can't prove it. Monotheists have faith in one God because they can't prove it. Nobody can prove conclusively that God is or isn't. There is no tangible evidence for the skeptics to wrap their senses around. Clearly, it's not an issue for you...consider the challenge to others for a moment. It is necessary that God can't be proven or disproven. Because the uncertainty requires a free-will decision from everyone aware of the possibility. Not deciding is the agnostic approach, but still a default rejection...no fence sitting. There is an absolute answer....some people will win the bet, and others will not. Of course in betting, one increases the odds of winning by knowing the options, risk of not winning, stakes of the game, I.e., what can be afforded to lose or gain. There is no certainty in games, life or beyond....except that there will be winners and losers. I said that I chose not converse with you but since no one else responded to this I chose to. You said that atheists rely on faith that there are no gods, insinuating that atheists are on the same footing as theists who rely on faith to embrace a god. In the purest sense the former is true because a negative can't be proven. The latter is untrue and I will discuss below. I have faith there is no god just as I have faith that I will not spontaneously combust before finishing this post, or that when I get home my dog will have not replicated by mitosis. Theists rely heavily on not being able to prove a negative, which has resulted in the advent of the "Flying Spaghetti Monster" and Bertrand Russell's "Celestial Teapot", both of which share the same validity of any god when using proof as the metric. There are an infinite number of things that can't be disproven. But rationally, a person does not accept these things without some evidence and or facts. Further, just because two opposing viewpoints such as ours cannot be proven, it does not mean they share the same likelihood of being true. We cannot prove today that there is not a secret alien spaceport buried in the ice of Pluto nor can we prove that a tree makes any sound when falling in a forest if there is no one present to hear it. Although neither can be disproved, they are not equally likely. I submit the same holds true for the existence or nonexistence of a supernatural omniscient and omnipotent being. I make a comparison below between the likelihood of the nonexistence of a supernatural being (A) versus the likelihood of the existence of a supernatural being (B). The universe exists and is governed by laws that we have discovered over time and proven to be true. New laws and properties may be discovered and proved in the future. If new data proves a contradiction in or to an existing law, that law would be invalidated or modified. There is no evidence supporting the existence of an invisible, unobservable, untestable, omniscient and omnipotent force. Such a force is not believed to exist. In violation of most or perhaps all physical laws there exists an omnipotent and omniscient being. This being although omnipotent and omniscient and capable of absolutely anything chooses to hide all proof of its existence. The proper path forward is to discard all physical laws, discard the logic that omniscience and omnipotence can’t logically coexist in one being and to worship this being. In weighing the likelihood of each position I submit that a world that exists within the boundaries of known and proven physical laws absent of any invisible, unobservable and untestable force in violation of those laws (A), is overwhelmingly more likely than a world that exists at the whim of an invisible, unobservable and untestable force who by it’s very omniscient and omnipotent existence violates all physical laws. And further, by its nature, the force never manifests itself in any way showing that it exists in violation of physical laws. In your last paragraph you state that there is an absolute answer to the question we are discussing to which I agree. You also state that in betting, one increases the odds of winning by, among other things, understanding the games stakes to which I disagree. This logic is flawed. If I need to draw a spade to make a flush, the odds are the same regardless if the stakes are one dollar or one million dollars. I am going to venture into conjecture here. I suspect that the subliminal point you are making is that regardless of the insurmountable odds against, or lack of logic supporting the existence of god you are still going to lean in that direction because the ‘what if” scenario is in your head, and you can’t risk the possible outcome of eternal damnation. In short, you believe because you are hedging your bet. Again, I am not saying I know this for sure, but rather that it is a possibility, given your assertion that the stakes of a bet influence the odds. dude...you are making a case against yourself for intellectual dishonesty...you set up arguments that aren't there, much less persuasive, just so you can beat yourself. and you challenge irrelevant stuff with false premises and baseless opinion, and riddled with fallacy...I'm not "insinuating" anything...its a fact that you can't prove there is no God. no sane person would "rely" on not proving a negative...think you meant "disprove a negative." The Bertand Russell stuff you quote has nothing to do with my propositions. where did I try to prove God exists? "A line moves because the book is trying to balance out the money being laid on either side. If the public favors one team too much, the line moves to attract support to the other team." Source: a professional sports book. the only point you should have taken away from my post is that somebody will be correct, or maybe not, and somebody will not be correct. there is absolutely nothing a rational person could argue for or against in that proposition. unless you were trying to discredit the writer...which is impossible for you to do or attempting to demonstrate your logical prowess? you would fail in my class...you don't get the material and instead of sticking to the subject, you digress into some logical fantasyland? "and...your idea of conversation is pointing out what you believe to be a mistake vs. arguing the merits of your view?" I was on the fence as to whether your intellectual dishonesty was not intentional due to indoctrination into a strong belief system or if it is intentional knowing it is necessary to make arguments for the unsupportable. I am leaning toward the latter. => I was not responding to any perceived claim of "proof of god". I went back and reread my post and I have no idea where you came up with that. I very clearly stated in the fist sentence of my post that I was responding to your comment that atheists relied on faith. I am not going to restate it all again. Go back and read it one more time, hopefully this time with comprehension, and tell me where I accused you of claiming you had proof of god. => You also completely scrambled the celestial teapot analogy. The premise is that believers insist that god(s) exists in the absence of all proof because they cannot be proven wrong. Bertrand Russell then posited that there is a celestial teapot orbiting the sun somewhere between the Earth and Mars using the same premise. Somehow you twist this into my assertion that you possess proof of god? => I generally understand odds as used and determined in bookmaking. If we were having this discussion relative to a dynamic topic that was being updated real-time with facts (analogous to bets), I would accept your point. However, just the opposite is true. The topic relative to the discussion I am trying to have has had few or no provable new facts for millennia. For this stagnant and age-old argument straight odds are applicable. The odds of drawing a spade to complete a flush remain constant regardless of stakes. "...what is that they call a response criticizing the person instead of arguing the merits of ones position?" Your last comments speak volumes about you. You said that I “don’t get the material” even though it was you who completely missed the point and did not comment once on that point which made up 80% of my post. You said “I don’t stay on subject” when it was you who somehow jumped from the point being presented (which you did not get) to some tangential question “where did I (you) try to prove god exists?” And in the process completely scramble the celestial teapot analogy. But, I saved the best for last. The comments you made above were in the context of you being a teacher and I am failing your class. In a previous post I said that you appeared to be condescending. I was wrong, you are a narcissist of the first stripe. Or maybe I wasn’t wrong and you are both. I agree. People need to just let people believe what they believe. Its attacked a lot because its something nearly everyone has in common, they believe in something. I'm an Atheist, and if somebody wants to know why I am, I explain why instead of firing back and asking them the same question and then go on to prove their reasons why wrong. Its not affecting me. For such overt and voluminous spamming, you must nakedly assume the to-be-spanked position, and so receive. Lean forward now, with hands grasped tightly on ankles. For you it will be quite cerebral as such. You must receive high frequency applications at significant vigorousness and amplitude to cause bright blushness. Imams present should receive such spanking thusly in triplicate. Sitting difficulties will proceed but temporarily if Allah is willing and healing of reddishness is granted. The Coo-ran-ran. The Coo-ran-ran. The Coo-ran-ran. "What the entire episode does, rather, is remind us — scholars included — that science might not always have all the answers. This forgery was detected not through lab analysis but through good old-fashioned humanities-based detective work. This was Sherlock Holmes, not "CSI." "
finally at least partly something I agree with Baden on. But the important thing to remember is they all got it wrong at first and they believed they were right. This is the pattern of science and scholars. Its just a mater of time before their failures are revealed. There is a belief that we know is right. The bible, gods word, tells us the way and that must be right. you do not know you are right. The only way to know, is to exclude all other possibilities. How exactly did you exclude all other possibilities? It's called coevolution. It was figured out long ago. No magic required. The link below with take you to dozens if not hundreds of scientific papers on coevolution written by evolutionary biologists. As a sidebar – I assume since your english skills and writing style improved dramatically in this post that you plagiarized the content from an apologist website. If you would take a couple of minutes to read what you are plagiarizing and then spend two more minutes verifying the content you would come off a lot more credible than you do. Given as constructive criticism. The best source of information about God and what God conveys to mankind is NOT the Bible, look for scholars, especially those that graduated from Yale and Harvard, they know a thing or two more than what God intended to communicate using the Bible. Following "scholarly" work rather than the Bible is a safe way to ensure oneself who is on the path to perdition. But why do you interpret the bible the way you do? You most likely follow one of the christian religions, so at some point a "scholar" convinced enough people that his view of the bible was the right one. Give someone who has no preconceived notions of religion a bible and I'm sure they'll have their own unique version. Though I doubt you could find such a person. "Using illustrations and the original text of the Book of Abraham it was found the doc-uments are in fact funerary texts that describe events in the afterlife of deceased Egyptians that is consistent with other historical and archaeological evidence. 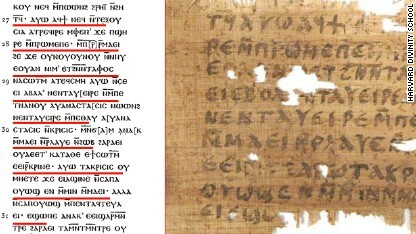 Today we can prove that Joseph Smith incorrectly translated the papyrus. Independent scholars, Egyptologists, are in agreement about the nature of the docu-ments. Only church sanctioned Mormon Universities still try to claim the translation is still correct. Mormon scholars currently do not discuss the translation since it's not open to debate, the doc-uments are clearly funerary in origin.-"
Once again, evidence that Mormonism is nothing more than a business cult !! More contradictions from that book of mythology known as the bible, or as I like to call it, the book of "this means that"
1CO 1:19: "For it is written, I will destroy the wisdom of the wise, and will bring to nothing the understanding of the pru*dent." ISA 14:21 Prepare slaughter for his children for the iniquity of their fathers; that they do not rise, nor possess the land, nor fill the face of the world with cit *ies. Ahhh I see! those directly quoted contradictory statements from the bible don't stand on their own, they need to be converted to what you think they mean. The word of god indeed. So exactly in what context would they not be contradictory? Keep twisting the words... this doesn't mean what is stated... very entertaining, and since god is nothing but mythology, I really don't give a rats azz what your imagination tells you about supposed "vain wisdom." Nobody has to put the laws of gravity "in context". This "God" character of yours (and primitive Middle Eastern Hebrew men) cannot communicate in a clear fashion, understandable by *everyone* without tricky "interpretation". And....Otoh...that context is not completely discernible. That's why there are so many sects reading the exact se book. They should all just talk to Kermit, as apparently, he has it all correct! Kermit...everybody on this site...including those on your side, know you are a jerk. You need to rethink your comments. My statement is not ignorant, but based on truth. Your context of the bible is quite different than my sisters. She believes in your god, but believes Noah's story was a metaphor. Context is not exacting....you dolt! Kermie....we all had a meeting and you were not invited. In a consensus vote, you are a jerk....sorry. Oh....one other thing. You can't spell. And you have no idea if your context is the right context. OH really? you mean I couldn't check and cross reference and all to see of the context..MOST of the context is right in the text..
Kermit...since it is your definition of what is context and what is literal, then you aren't guaranteed to be correct every time, which is what we have been trying to tell the bible thumpers. You have no idea what is a parabolic meaning and what is context. Literal is even harder to establish. Ignore him. I delete everything he posts without reading it. not talking about gravity..it is very clear...again I assume you don't need context for anything......that's fine....I wonder how you get along then? I'll bet you think that you are **wise** to believe that, huh? Here is my impression of Kermit. Context, Context, blah blah blah Context. kermy.....jeebus is waiting for you. he is fully engorged and anticipating your silky mouth. do you have tall buildings where you live? Much like "beer-goggles" the ever popular "christian-goggles" allow you to read between the lines of the bible using "context" to reject anything it contains that you disagree with while retaining anything you do agree with as the unchangeable "absolute word of God". The goggles come with a warning however that reads "Will cause reality blindness in land mammals". @kermi Do you require an explanation of context every time someone makes a plain direct statement to you? I wonder how you get along. I don't need to read an entire book just to understand a direct to the point sentence. There's no need to force ambiguity into those quotes unless you're doing the "this means that" personal interpretation. I didn't say youhad to read the entire book......but as I said...most of the "statements" posted here to show "contradictions" were PARTIAL statements.. Yet to fail to give one example of exactly why these quotes are taken out of context.. I had a very lazy 7th Grade teacher who used to do the same thing; tell us to just read the lesson instead of explaining what the lesson said. When we asked a specific question, he would tell us to...read the lesson. It was by far the easiest way to "teach" and I am reminded of that here. If a Bible verse furthers the cause, it is to be taken literally. If a Bible verse is detrimental to the cause, it is either: taken out of context; is allegorical or metaphorical; refers to another verse somewhere else; is an ancient cultural anomaly; is a translation or copyist's error; means something other than what it actually says; is a mystery of god or not discernible by humans; or is just plain magic. Christian definition of context: "whatever aligns with the beliefs I hold"
I am reminded of a Hamsta running around and around while the word "context" is being flashed on a screen in front of him. Rather like Alex DeLarge, without the stylish bowler.